With Christmas coming up now is the perfect time to start pushing your EI42 store. Top retailers such as Amazon, Play.com, HMV, Comet, Dixons, Orange, Toys 'R' Us and Marks and Spencers allow yourself and your friends to earn cashback through EI42. With the average Cash Back around 5% on a Christmas shop of £1000 you will be saving £50! Now imagine your friends spending that and you earning cash back on their purchases! If you have signed up already your EI42 shop URL will look like mine below. Now is a perfect time to be emailing it to your friends and family, adding it to social networking sites such as Facebook and Myspace, adding it to your email or forum signature and telling people in the pub! Happy Christmas shopping and I hope you earn plenty through yours and your friends cash back! The dam forms one edge of the lake. Boating is a popular pastime. Water from the lake supplies homes all over the West Midlands. The first signs of spring were starting to show. As it started raining this faint rainbow appeared. You can just about see the whole rainbow in this shot. The mist started to get heavier at this point. I stayed with the runners - for support obviously. The tower's almost Gothic look in the creepy mist. 2009 has been a tough year for Bloggers to make money compared to 2008 but there have been opportunities and ad networks have matured to become better accepted by marketers. Gone are the large amounts of money for private ad sales in favor of link exchange agreements and PPC amounts have tumbled. Here is how some of my sites have fared over the past year for monetization. Sponsored reviews have fared well in 2009 with advertisers keen to show their products in a natural way to consumers and search engines. They are often criticized for degrading the quality of a blogs content but I've found a sponsored review mixed in between a number of good quality posts to perform well. Strict new rules for Bloggers in the US may mean some good opportunities for non-US blogs in 2010. It's been a rough year for Pay Per Click marketing, the amount made per click in 2009 has plummeted on a number of my sites, hopefully 2010 will see the PPC market performing much better. Google Adsense - Has been a reliable income throughout the year though relies heavily on people clicking high value ads. Adsense performed well on my iPodHistory site before I sold it however has failed to do well on 12stix or ImAFish. Clicksor - Has replaced Adsense on a couple of sites where they are not suitable for Adsense or have been banned. The amount per click is fairly poor even compared to Adsense. TNX - Has been a consistent payer throughout the year but relies on paying a small amount for a lot of adverts. LinkLift - Recently out of beta, LinkLift is one of the newer players but has shown good growth throughout the year. Linkworth - Advertising revenue has dried up significantly from Linkworth over the past year. Text-Link-Ads - TLA has paid consistently low amounts all year. Teliad - Has paid consistently for higher Page Ranked pages. This time last year there was a lot of money for private ad sales however this has declined significantly. Companies are now turning to link exchange programs rather than paying directly for ads. Even the better paying gambling sites have been cutting back on their advertising budget. Hopefully we are over the worst in 2009 with the slump in the advertising market. There are plenty of opportunities out there for Blog monetization but Bloggers need to work that extra bit harder to attract the advertisers. After appearing on last weeks Above & Beyond Group Therapy the chilled out progressive tunes of Shingo Nakamura have been some of my favourite. Here are some of my top tips for additional OS X functions, most have come from my experience at home and work. Most Mac models come with an external connector for attaching additional screens (normally a mini DVI connector). From this you need a mini DVI to DVI connector then another cable to plug into your screen, this can be a DVI to VGA cable, DVI to DVI cable or as I have a DVI to HDMI cable. All the cables are very cheap and can normally be picked up from Ebay. OS X should automatically detect the second screen plugged in and you can open system preferences to adjust the resolution. 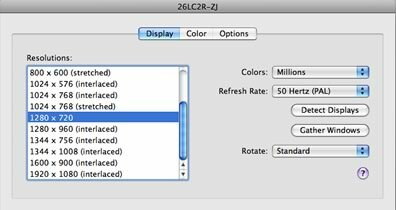 You may have to play around with the settings, my 26" LG HD TV looks best on 1280 x 720 rather than its native resolution. I've had my iMac plugged into my TV for the past 6 months and people still think its cool how I can move my mouse from one screen to another. 2. Sharing your Internet over Wireless. While I was at University our local cable supplier didn't give out free wireless routers so to save buying one I shared the Internet out through my iMac's wireless. In Leopard the Internet can be shared from the Sharing section in System Preferences.